Bellator MMA’s final card of the summer takes the promotion to the Sanford Pentagon in Sioux Falls, S.D., for Bellator 204. The main event is a non-title affair where bantamweight champion Darrion Caldwell goes up to the featherweight division to face Noad Lahat. Caldwell defended his belt for the first time in his last fight when he beat Leandro Higo by first-round submission. Lahat won his last fight via unanimous decision over Jeremiah Labiano. The co-headliner takes place in the welterweight division, where prospect Logan Storley looks to remain undefeated against veteran A.J. Matthews. 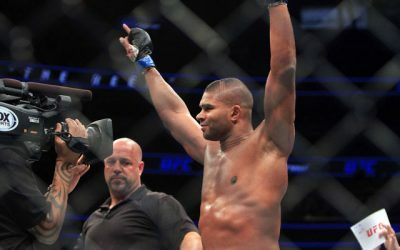 Matthews, who had gone two years without a victory, was able to snap a four-fight skid when he defeated UFC veteran Kendall Grove by split decision. 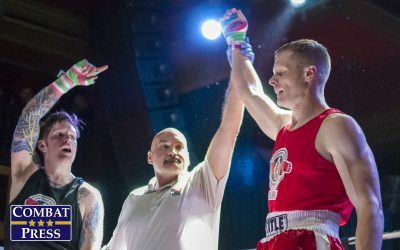 Storley, a skilled wrestler, notched his seventh victory by beating Joaquin Buckley via unanimous decision. 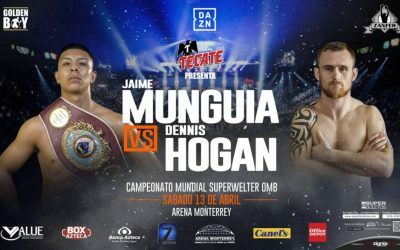 The main card also features a bantamweight battle between James Gallagher and Ricky Bandejas. Rounding out the lineup, featherweight Tywan Claxton faces Cris Lencioni. 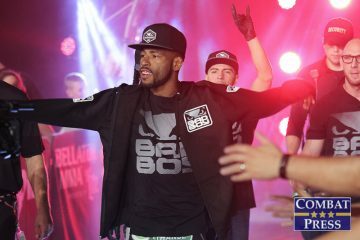 The Bellator 204 preliminary action airs live on Bellator.com at 7 p.m. ET. 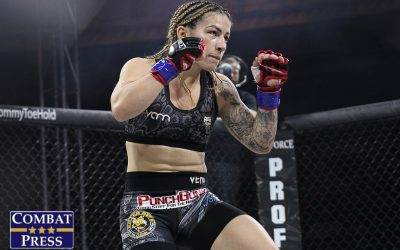 The main card airs live on the Paramount Network at 9 p.m. ET. 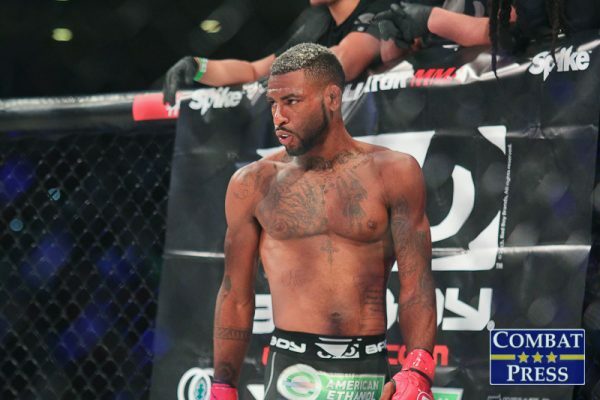 Darrion Caldwell won the Bellator bantamweight title from Eduardo Dantas and then defended it successfully against Leandro Higo. Now, he’s jumping up to featherweight to meet Noad Lahat. What’s up with Caldwell? Could Bellator have found a deserving title challenger for him instead? Caldwell is no stranger to the featherweight division. 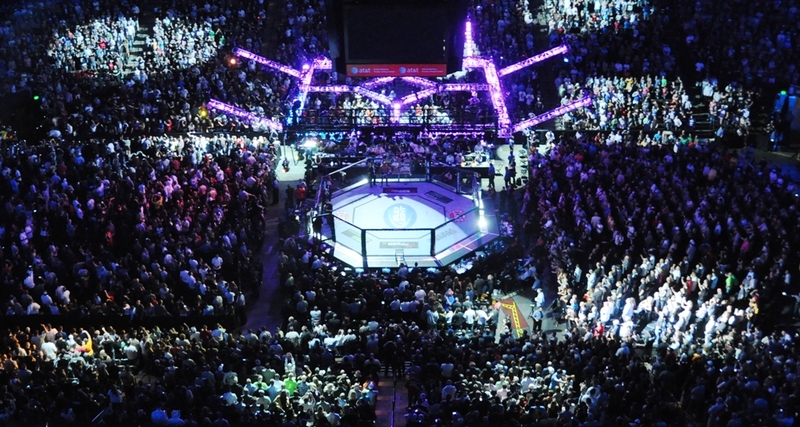 In fact, it’s where the bantamweight champion started off in Bellator. It’s where he fought when he was with Legacy FC. Caldwell has hinted at this interesting move by calling out the promotion’s featherweight champion, Patricio Freire, on Twitter. He also had an incident after his victory over Freire’s teammate, the aforementioned Higo, at Bellator 195. Caldwell went so far as to mention possibly making a move to featherweight as well after that fight. The 30-year-old champ has looked unstoppable in his career. Outside of one loss to Joe Taimanglo — a loss Caldwell avenged in his very next fight — Caldwell has been a dominant force in Bellator. Heck, his second fight ever at the bantamweight level was against Joe Warren, a former Bellator titleholder, that resulted in a one-sided drubbing and a first-round submission victory in favor of Caldwell. 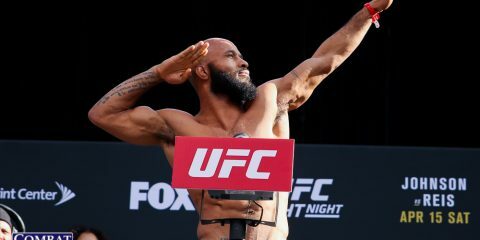 Sure, Bellator could have found a bantamweight title challenger for Caldwell, but this is a setup for a bigger future endeavor for the star fighter. There is clearly unfinished business at the featherweight level for Caldwell. In addition, there isn’t much for Caldwell to do right now as a bantamweight. Warren is coming off a loss to Taimanglo. Taimanglo, even with the victory, fought Caldwell too recently to make a third fight all that enticing. The bantamweight division lacks challengers right now. Instead of waiting around for a new threat to emerge, Caldwell is staying active. If Caldwell is successful and gets the victory, then there is a big superfight that Bellator can make between its champions in two weight classes. And, guess what? Caldwell has already laid the foundation for that fight by going after Freire on Twitter and in his post-fight comments following his last victory. Caldwell has developed into a very complete mixed martial artist over the course of his career. His wrestling is dominant, and his striking has become another tool in his box. Caldwell is most definitely the favorite in this fight against Lahat. 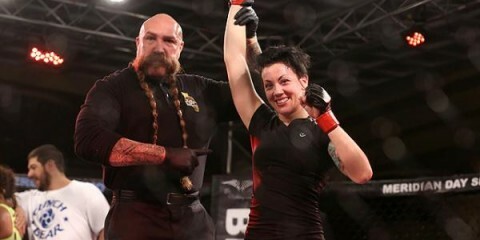 That superfight could become a reality following a Caldwell victory in South Dakota. A.J. Matthews broke a four-fight skid with a win over UFC veteran Kendall Grove. Bellator is rewarding him with a co-headliner slot opposite undefeated blue-chip prospect Logan Storley. Is Matthews the man to derail Storley’s hype train? No. It won’t be Matthews. Storley is one of Bellator’s biggest signings and brightest prospects coming out of collegiate wrestling. He has fought four times under the Bellator banner, and he has looked dominant in every outing. 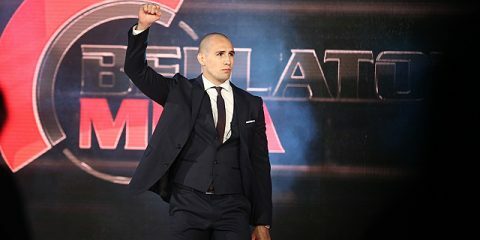 Storley is slowly being brought up through the ranks, and Bellator is providing him with an experienced veteran opponent to help build his record. A victory for Storley will be a good step into getting some stiffer competition next time out. Matthews did beat Grove, but a victory over the UFC castoff meant a lot more many years ago than it does now. Grove is a completely different fighter from Storley, too. Storley is overwhelming with his wrestling, whereas Grove is not really known for his takedown prowess. Matthews is going to be in a lot of trouble if he can’t stuff Storley’s shots. Once Storley gets him to the ground, it will turn into a nightmare as he struggles to reverse position and survive three rounds without gassing. Storley won’t just lay and pray either. He also has some good ground-and-pound to help wear down his opponent. This fight is a good reward for Matthews, but it most likely won’t bring him another victory. There are a number of undefeated up-and-comers on this card beyond the aforementioned Storley. 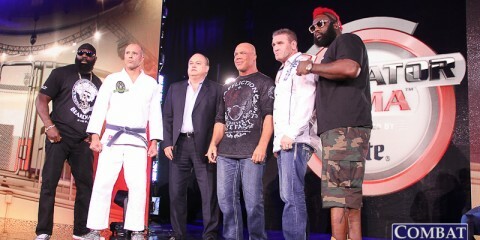 Which one of these other fighters has the tools to eventually rise to stardom in Bellator or elsewhere? The easy answer to this question is James Gallagher. Gallagher has become one of Bellator’s brightest prospects. He has consistently been a main-card staple for Bellator. The Irishman made his Bellator debut on the main card, and that is where he will likely stay. Gallagher has choked out nearly all of his opponents en route to a crisp 7-0 record. The 21-year-old has been brought along nice and slow to help build some momentum. 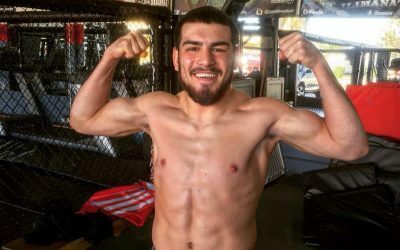 The SBG product will get a big test against Ricky Bandejas at Bellator 204. This will be Gallagher’s first bantamweight fight as a pro after a successful featherweight run. It’s a good move considering the shallow state of the division in Bellator. Gallagher could be just a few fights away from challenging for the bantamweight title, which just happens to be around the waist of the Bellator 204 headliner. This is a big fight for Gallagher not only because he’s set to face an experienced opponent, but because of how much time he has spent outside of the cage. Gallagher hasn’t fought in over a year due to various injuries. 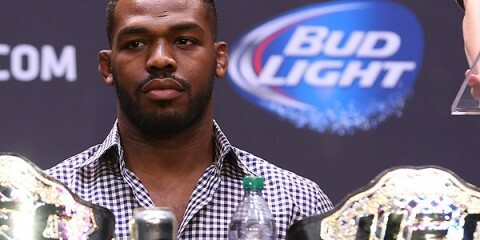 This has the potential to be a big roadblock in his return fight. It will be interesting to see how Gallagher deals with adversity of this fight. If he wins — and wins convincingly, like he has been — then he has nowhere else to go but up. The welterweight clash between David Michaud and Corey Davis. Davis has notched a perfect 3-0 record so far, with all of his fights ending before the final bell. 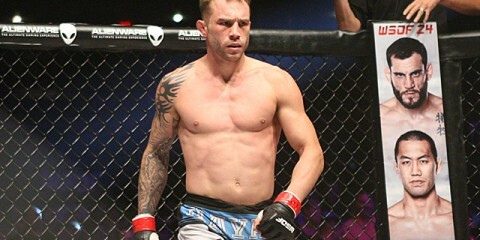 Michaud is an interesting opponent who has a wealth of experience and was a former member of the UFC roster. Michaud’s recent fights — and most of his fights in general — have been finishes, win or lose. When two guys are looking to get the finish, it makes for a fun scrap.